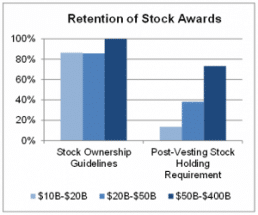 Meridian examines policies for risk adjusting payouts, use of company stock, and retention of stock awards. Governance policies related to executive compensation are on the rise as a result of increased influence of bank regulators, shareholders and the Securities and Exchange Commission (SEC). 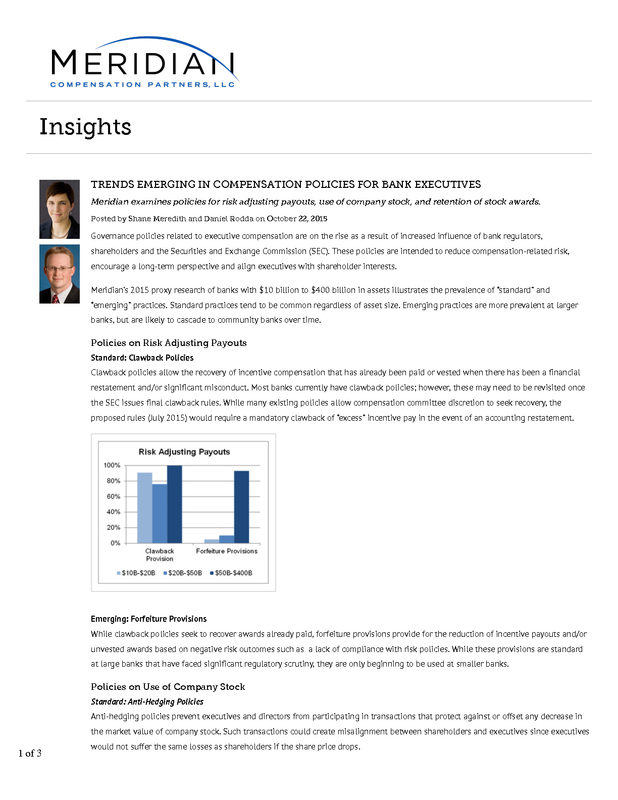 These policies are intended to reduce compensation-related risk, encourage a long-term perspective and align executives with shareholder interests. Meridian’s 2015 proxy research of banks with $10 billion to $400 billion in assets illustrates the prevalence of “standard” and “emerging” practices. Standard practices tend to be common regardless of asset size. Emerging practices are more prevalent at larger banks, but are likely to cascade to community banks over time. 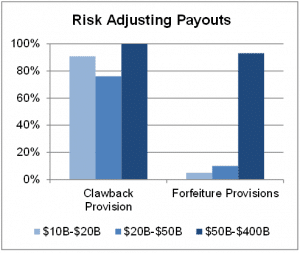 Clawback policies allow the recovery of incentive compensation that has already been paid or vested when there has been a financial restatement and/or significant misconduct. Most banks currently have clawback policies; however, these may need to be revisited once the SEC issues final clawback rules. While many existing policies allow compensation committee discretion to seek recovery, the proposed rules (July 2015) would require a mandatory clawback of “excess” incentive pay in the event of an accounting restatement. While clawback policies seek to recover awards already paid, forfeiture provisions provide for the reduction of incentive payouts and/or unvested awards based on negative risk outcomes such as a lack of compliance with risk policies. While these provisions are standard at large banks that have faced significant regulatory scrutiny, they are only beginning to be used at smaller banks. Anti-hedging policies prevent executives and directors from participating in transactions that protect against or offset any decrease in the market value of company stock. Such transactions could create misalignment between shareholders and executives since executives would not suffer the same losses as shareholders if the share price drops. The SEC’s proposed rule (issued February 2015) requires companies to disclose the types of hedging transactions (if any) allowed and the types prohibited for both employees and directors. 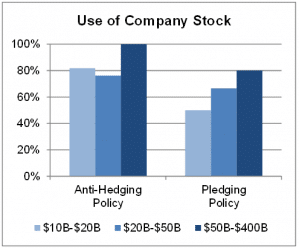 As seen in our study, most banks already disclose formal anti-hedging policies. Pledging policies prevent or limit executives’ and directors’ ability to pledge company shares as collateral for loans. Pledged company stock creates a risk that executives may be forced to sell shares at a depressed stock price in order to raise cash to cover the loan margin, which could further the decline in stock price. However, some companies allow limited pledging with pre-approval. Pledging enables executives to monetize share holdings without selling company stock. Since 2006, public companies have been required to disclose the amount of company stock pledged by executives and directors. Proxy advisory firms and shareholders typically criticize only significant levels of pledging. Over 80 percent of banks in our study have stock ownership guidelines that require executives to maintain a minimum level of ownership. Ownership guidelines are typically defined as a multiple of base salary. For CEOs, the most common ownership requirement is five times base salary, while other executives range between one times and three times base salary. Many investors and shareholder advisory firms have started pushing for additional stock holding requirements. Holding requirements restrict executives from selling stock earned from equity awards or option exercises for a period of time after vesting or exercise. Some holding requirements require executives to hold a percentage of shares until ownership guidelines are met. More rigorous policies require executives to hold a percentage of shares for a set period of time (e.g., one year after vesting) or until (or even after) retirement. Banks have been ahead of many industries in adopting these governance practices as a result of the regulatory scrutiny on compensation programs, and we expect the emerging practices will continue to gain in prevalence across banks of all sizes. Daniel Rodda is a lead consultant for Meridian Compensation Partners, LLC, in the Atlanta office. Shane Meredith is a senior consultant based in Meridian’s Lake Forest, Illinois headquarters. Meredith’s work in executive compensation focuses on the design of incentive arrangements including equity-based long-term incentives. She also works with executives and boards to develop pay-for-performance measurement systems, compensation principles and governance best practices. 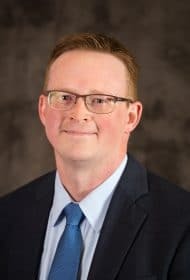 This article originally appeared on BankDirector.com.